DJI Spark Drone is Here ! In Depth Review & Comp. with Mavic and Breeze. As some of you already know, DJI has just announced a brand-new drone, DJI Spark, that’s going to officially come out this summer. When it comes to the release date and pricing, there’s a whole chapter dedicated to those things so make sure you check them out. For now, I would just like to introduce you to the Spark, another miniature drone by DJI. Even though the Mavic Pro was an absolute champion when it came to compactness/performance ratio, it’s safe to say the Spark takes things one step further… at least in the compactness department. In addition to that, it also has a very interesting special feature that’s going to sweep you off your feet. With all that being said, let’s jump straight to action and see what is this little fella is all about! The first thing I should mention size-wise is the fact that DJI Spark is not a foldable drone. Well, it’s propellers fold but its “arms” don’t. So, even though many reviewers will (and already did) call it a foldable drone, you will know that’s in fact a mistake. But, do not let that fool you – the Spark is still as small as a soda can. It weighs in at amazing 300 grams (10.6 ounces) and its exact dimension are as follows 143 x 143 x 55mm. The latter is an amazing achievement, especially considering the iPhone 7 Plus is somewhere close. On the other hand, DJI Mavic Pro stands at 83 x 83 x 198mm in its folded form. I’m sure you all know that the Mavic becomes huge once it spreads its wings so the Spark ends up looking like a children’s toy when compared to it. Yuneec Breeze is a stray dog in this story. Its exact dimensions are 195 x 195 x 66mm. It is relatively thin, I’ll give it that, but all other numbers are off the charts… With all that in mind, I believe the winner in this segment is quite clear – it’s DJI Spark with its amazing hardware and smartphone-like size. 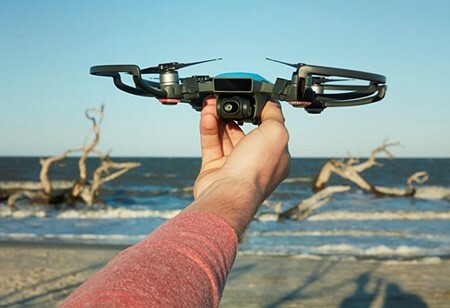 Before jumping to any conclusions, you first need to know that these 2 drones are meant for virtually the same group of people – drone amateurs who aren’t looking to get into the hobby but instead want a portable aerial camera. 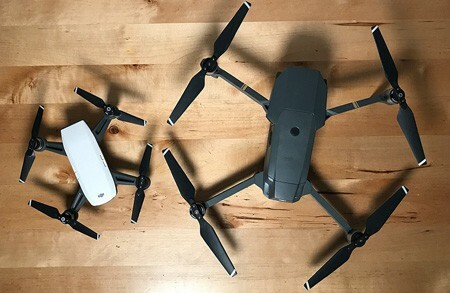 While DJI Spark and DJI Mavic Pro cannot be considered as direct competitors, these 2 can, and they are making it quite clear! 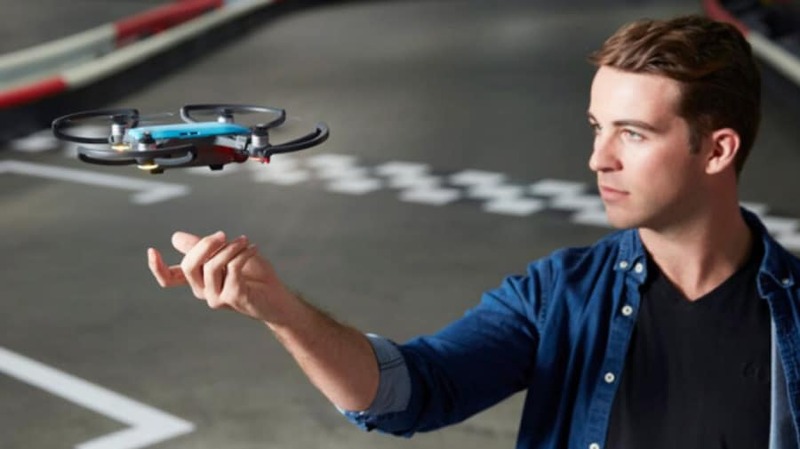 With a very similar price tag (at the moment, standard version of DJI Spark is just $50 more expensive than the standard version of Yuneec Breeze), specifications and design, their competitive spirits become quite obvious even to the biggest beginners. Still, I’d warn you that the fight isn’t that fair since DJI Spark has a significant advantage at the very start. How? Well, it is going to have a dedicated controller (in addition to smartphone-controlled flight) while Yuneec Breeze can only be controlled via smartphone. Moving forward, Yuneec can only fly around for up to 10 minutes while DJI Spark stomps it with 15. When it comes to operating range, Yuneec can’t even get close to Spark’s 2 kilometers as it’s only a selfie drone. Camera quality is actually pretty similar with only difference being the resolution – Breeze can shoot in 4K while the Spark is limited to FHD. Despite that, I still like Spark’s videos more as the sensor collects a lot more natural light than Yuneec’s counterpart. In the end, I believe you’ve all realized by now that the Spark is a clear winner. With that being said, I would even go as far as to say that it’s one of the best drones that came out of DJI’s laboratory. DJI Spark is in no way a direct competitor to the DJI Mavic Pro. That’s crystal clear from the very first look at their technical specifications and price tags. Mavic Pro has roughly 25 minutes of flight time and up to 7 kilometers of lag-free operating range. On the other hand, the Spark can boast as long as it wants with its 15 minutes of flight time and 2 kilometers of range (not only for controlling and FPV monitoring as well). In terms of features, DJI Spark has the standard TapFly and ActiveTrack and plenty other interesting smart flight modes that will help you capture cinematic masterpieces. Additionally, it also has a very special feature called PalmControl which we will discuss later on. Once again, I’d like to point out that these 2 aren’t direct competitors. As a matter of fact, they’re not even near each other in terms of price points yet alone design characteristics, performance and all that. It’s quite obvious DJI plans on selling the Spark as, by far, the most affordable travel-friendly drone that offers professional-grade aerial photography. I’m sure many of you know that the Spark can be preordered. DJI announced in their official video that it will be priced at $499. At the moment, it is available for preordering on Amazon and the official DJI website. 2 versions are available at the moment – standard and fly more combo. 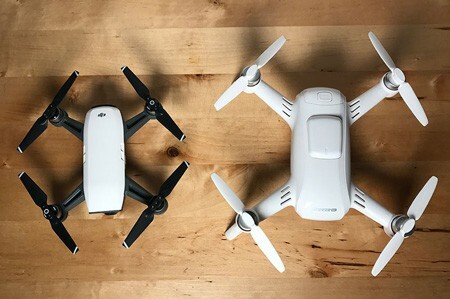 The price gap stands tall at 200 ($499 and $699) but it is reasonable since FLY more combo gets you plenty accessories that will, indeed, allow you to fly more. 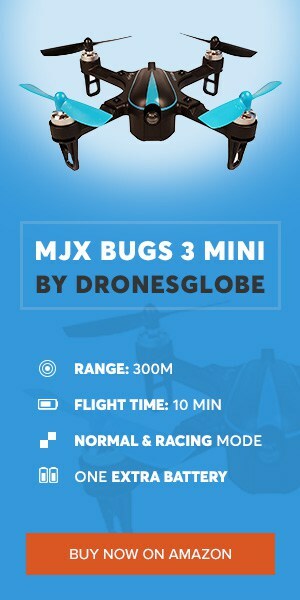 The combo includes an extra battery, four pairs of propellers, 4 prop guards, dedicated charging hub and a small shoulder bag for carrying this precious little thing. It’s quite a good deal, you have to admit! In terms of DJI Spark release date, I am afraid to let you know that the official release date has not yet been set. Luckily, DJI announced that it will be coming out sometime this summer so we won’t have to wait for it too long. One of the coolest features of DJI Spark is definitely PalmControl. What this piece of exceptional software does is it effectively lets you control its flight with your hands… without having to use the controller or your smartphone. The processes behind this feature are actually surprisingly simple – you wave your hand in front of you and the Spark will recognize it. After that, you simply swipe your hand in a desired direction and the Spark will follow in the same pattern. It’s a bit weird at first, but once you get accustomed to it, this feature will never cease to amaze you. However, people usually suspect this sort of miraculous technology to have significant drawbacks in terms of responsiveness. Luckily, the folk over at DJI polished the software to the max and annihilated even the smallest responsiveness issues. They made sure the end product is as flawless as possible! In the end, that can be said about the entire drone and not just PalmControl feature. It’s a breeze of fresh air in the industry and could be an excellent method for getting early buyers onto the bandwagon. If you didn’t realize by now, DJI Spark has a camera! Yup… It’s actually one of its best aspects. Some would say it’s almost on par with P3’s cameras, and as far as I’ve seen they are not that far off from the actual truth. We are looking at a 1/2.3-inch CMOS sensor that is able to effectively capture 12MP photos and videos. Best of all, it incorporates a 2-axis gimbal stabilization system (yes, you read that correctly, it’s 2 not 3-axis) which stabilizes on both axes but cannot pan left and right. But still, the stabilization works like a charm and you can expect a silk smooth videos at all times. Full HD is all you’re getting here, 4K would be a little too much to ask for, right? But don’t let FHD fool you, the image is crystal clear and, I’d love to argue, not just on par with P3 but with P4 as well. I will start the summary off by stating that the Spark is in no way a direct competitor of the DJI Mavic Pro, just like I’ve already done so earlier in this article. I know that most of you (and most online reviewers) will try to draw the lines connecting them… but in reality, they’re obviously not meant to steal each other’s buyers. If that’s not clear just by looking at their sizes and specifications, then I don’t know what is! In the end, I believe the Spark is an outstanding model and could even be the next big thing in the drone industry. Cramping together so many amazing pieces of hardware in such a tiny space was the best thing DJI did with the Mavic Pro. Now with Spark, I believe it’s obvious that they have drastically outdid themselves. The compactness and sheer power this little fella possess, in combination with excellent features and competitive price tag, all make up for what seems to be the best drone in 2017; so far.